Take your audio to the next level. Once you've decided that you want better sounding audio, the upgrade path you'll embark on is fraught with costs. The audio space is one of the worst offenders when it comes to pillaging your wallet. 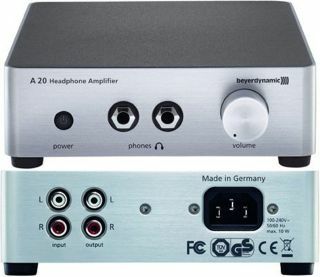 If you can catch a deal, more power to you, and right now there's a really good bargain to be had on BeyerDynamic's A20 headphone amplifier at Buydig.com. It's listed at $499 with free shipping, but if you enter in coupon code AMPED, it will knock $200 off the price, bringing your total down to $299. You won't find a better deal on this (though do share in the comments section if you can prove us wrong)—the next lowest we could find is at Amazon, where it's selling for $439. You can plug up to two headphones into the A20. It's not going to work miracles if you have a crappy set of cans, but if you own a decent pair of headphones, this should help bring them to life. With a high-gain RCA input, the A20 should work with most sources. This can be looped through with BeyerDynamic claiming no signal loss thanks to the hard-wired RCA output. Go here to take advantage of this deal. Also be sure to check out our guide on the best DACs.